BirdLife International’s Global Species Programme are seeking information and comment from both professional and amateur birdwatchers and conservationists to inform a review of the IUCN Red List status of three duck species: Maccoa Duck, Ferruginous Duck and White-headed Duck. Topics for each of these species are now open for discussion on BirdLife’s Globally Threatened Bird Forum where interested parties can contribute information relevant to the assessment of the species’ threat status and conservation. The closing date for preliminary discussions is 17 July 2017. Ferruginous Duck (Aythya nyroca): downlist to Least Concern? The species is currently considered as Near Threatened. However, there does not appear to be any evidence that suggests the species presently approaches the thresholds for listing as a Threatened species under any criteria. It is proposed that the species is downlisted to Least Concern. The species is currently listed as Endangered on the basis that mid-winter counts have suggested that the population has undergone vary rapid declines. However, there has been some difficulty in deciphering population trends due to, for example, mismatches in population estimates and the possibility that many individuals may be missed during winter counts. Information and comments are sought regarding the species so a better assessment of the species’ global Red List status can be made. The species is currently listed as Near Threatened due to its moderately small population size and ongoing declines resulting from a variety of threats. Information is sought regarding population size estimates and population trends for this species to help decide whether this species warrants uplisting. Recent assesment in Poland: 100-130 breeding pairs (2009-2013) what is 0.5% of European population and 0.7% of EU population (Chodkiewicz et al. 2015). This is about Ferruginous Duck (Ayhya nyroca). 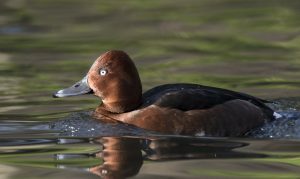 At least in Slovakia the Ferruginous Duck still belongs to threatened species. The species is still rare, Population was estimated to 8-20 pairs (Danko at al. 2002), recent estimates (Ridzon et al. 2014) indicate moderate population decline 20 – 50 % and stable distribution area trend with maximal difference up to 20%. During years 2011-2013 the species was surveyed in a nation-wide survey in all SPAs where the species is a trigger species at 27 sites and only at 2 sites was proved successful breeding (both in Medzibodrozie SPA). Overall population in Slovakia is concentrated at 2 regular breeding sites only in Eastern Slovakia: Senné SPA (3-5 pairs) and Medzibodrozie SPA (1-3 pairs) and there are several other sites in Southern and SW part of Slovakia with proved breeding of 0-1 pair after year 2000, but total population recently do not exceed 5-10 pairs annually, according to the species management plan by Pačenovský & Repel (2017). Main threats are drought (effecting some key sites including Medzibodrozie SPA) leading to drying up most of suitable sites for migration and breeding in some years, other threats include intensive fish-farming, tourism development, etc. The fact is that much of the conservation status issues regarding the Ferruginous Duck is based on outdated and extrapolated numbers from Central and SE Asia, which numbers are 10 or 20 years old now! One can not downlist a species based on old data presumed to be valid despite that current IWC numbers from Asia countries do not match those figures! See my comments as well on the Red List Forum on BirdLife page. Some comparatively recent information on the state of White-headed Duck in Ukraine can be found here: http://www.rufford.org/projects/yuri_vergeles (the results of the survey of a neglected part of White-headed Duck migration route in Crimea). Here is another short summary for the same work. White-headed Ducks regularly migrate through Crimean peninsula where Eastern Crimea hosts the majority of birds and the factors of threat seem to be very different between certain staging sites. The synopsis of all recent data on White-headed Duck in Crimea can be found here. Moreover, there is a growing number of records of White-headed Ducks along Ukrainian coast of Black Sea too and one confirmed case of breeding in Crimea in 2000 year – see here. Ferruginous Duck is still very rare species in Ukraine though it shows some signs of recovery in recent years (e.g. a number of registrations in breeding time in Eastern and Central Ukraine). Some data on the breeding of species in Crimea may be found here. Now I am very busy jumping from one trip to another but after 18nd July be able to prepare short summary on the state of both species in Ukraine.